In condemning New Year’s celebrations and making it easier for jihadists to travel through the country, Turkish President Recep Tayyip Erdogan and his Islamist government helped create the climate that led to the New Year’s Eve terror attack in Istanbul, secular critics of Erdogan say. 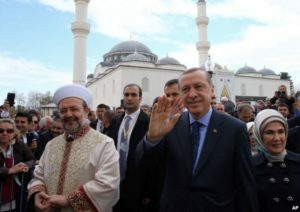 Erdogan’s critics point to the religious-based criticism last week of New Year celebrations by pro-government media outlets and by Turkey’s leading Islamic cleric, Mehmet Gormez, head of the country’s Directorate of Religious Affairs, an official state institution. Islamic State of Iraq and Levant (ISIL) claimed responsibility for the terror attack at the Reina nightclub that left 39 people dead. Gormez condemned the massacre, but that hasn’t mollified a group of Turkish civil society representatives, who filed a criminal complaint against the cleric, saying his sermon encouraged the targeting of New Year’s Eve revelers. Ersoy is among the critics of Erdogan who contend he is responsible to some degree for the rise of ISIL. Critics say the president’s ruling Justice and Development Party has created a climate that allows radical Islamist thinking to thrive. Some Erdogan critics say Ankara’s intelligence agencies actively channeled arms to jihadists and made it easy for foreign fighters to travel through Turkey to reach Syria.